The F.B.I. 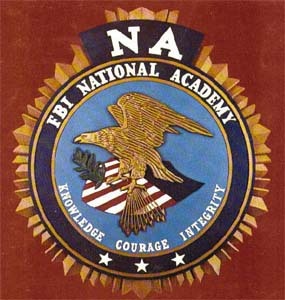 National Academy Seal is symbolic of the united effort on the part of all graduates of the F.B.I. National Academy to maintain the high ideals of the law enforcement profession. Each facet of the National Academy's academic achievement, strength, valor, and integrity is embodied in the symbols and colors of the seal. The eagle represents courage of law enforcement, flanked by the academic excellence and law and order, as represented by the olive branch. The strength in body and mind necessary for law enforcement is symbolized by the arrows. The eagle stands on the United States shield. The red stripes of the shield symbolize the courage and strength necessary in law enforcement and the white stripes stand for light, peace, and truth. The unity of law enforcement is represented by the 13 stripes comprising the shield, the 13 arrows and the 13 appendages of the olive branch, reminiscent of the 13 original states. The motivating ideals of the National Academy are expressed in the motto: "Knowledge, Courage, Integrity". The peaked, beveled edge surrounding the National Academy Seal represents the continuing forces of adversity facing the law enforcement community. Visit the F.B.I. National Academy Association. 5427 visit[s] to this page.